Governor Dickson began by commending Chief Bode George for his meritorious service. Mentioning that the party is not comfortable as it relates to chief George and the recent events at the convention. The governor stated that the PDP needs the South West and the Committee had come to seek his guidians as to how the party can chat a way forward as a tested marina. Speaking, Ambassador Wali also commended Chief George for his maturity and leadership. 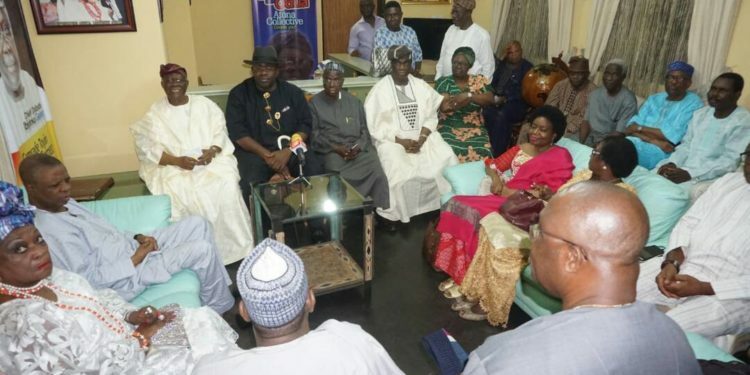 He made an appeal to the supporters of chief Bode George and apologised onbehalf of the entire PDP to them trusting that the meeting will produce favourable fruits. In response, Chief Bode George commended the Chairman and his team for their efforts. In his remark, ‘I have no qualms with Secondus and as a party man, you don’t destroy what you built’. I assure that at the end of this, with you Dickson and your team on board, we will be able to put our house together with justice, equity and fairness. He prayed God to deliver the party and assured the public that it is simply another experience in the party rebranding process.